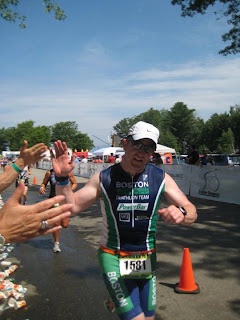 Big week for the blue and green representing the team well in northern New England at two big events, the Age Group Nationals Olympic and Sprint in Burlington, Vermont and Timberman Sprint and 70.3 in Gilford, New Hampshire. Over at the Age Group Nationals, very impressive performances by Jamie Strain, Matt Pokress, Keith Rousseau, Nancy Arena, Rachel Saks Aronis, Carolyn Soules, Maggie O’Toole, and Michelle Rousseau in the Olympic and by Trish Henwood in the Sprint. Maggie earned top honors in her division, with her Jamie, Matt and Trish all qualifying to race in Worlds in New Zealand! At Timberman, Brendan Hall, Matt Coar, Beth Edwards, Ed Galante, Dave Marinofsky and Brenda Chroniak, represented the team well in the Sprint, with Brendan ending up on the podium with a 2nd place age group finish. 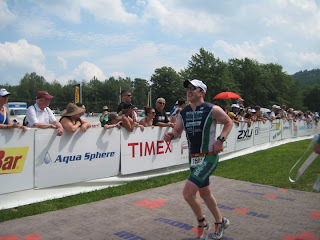 The following day in the 70.3, Jamie, less than 24 hours after qualifying for Worlds heads over to New Hampshire and crushes Timberman 70.3 with a 26th over all finish. Not far behind him Jen Scalise- Marinofsky took 2nd place in her age group and there were impressive performances by Braden Larmon, Brian Kearney, Noah Manacas, Glen Cote, Sean McCormick, Paul Newman, Tim Daley, Mark Pelletier, Ira Sills, and Janice Biederman. I would also like to mention Ira earned 2nd place in his division qualifying him for 2012 70.3 World Championship in Las Vegas!Congratulations to alll! We headed up to New Hampshire on Friday, August 19th for the Timberman Sprint, and Timberman 70.3. We checked in early at Gunstock Mountain so we could settle down and relax for the remainder of the day. Both of our families were coming to our races to cheer us on. We met up with Ali’s family at Lago in Meredith, NH to load up with carbs! For all you wrestling fans, Triple H was there enjoying a lovely chicken parm dinner as well! 4:30am on Saturday came very quickly, and it was time to wake up and go to the Timberman Sprint as a fan! It was great to watch and cheer on Ali and my fellow BTT teammates competing in, and rocking the Timberman Sprint! Great performances all around! At dinner on Saturday night, the nerves started to kick in as I realized how close I was to competing in my first Half Ironman… Only hours separated me and the sound of the gun going off to start my swim wave! Race Morning – I arrived at Ellacoya State Park around 4:50am. Not feeling rushed I had time to relax, eat my breakfast and start going through the race in my head. Transition – I got into transition with plenty of time to set up my gear. Two of my hometown friends racked directly across from me which helped make the time fly by. The unfortunate thing about being directed to the beach was that I had an hour and 10 minutes to kill until my swim wave started. I had planned accordingly and made sure to bring a bottle of Powerbar Perform and Powerbar Energy bar with me on the beach. It was also nice to see my family find me and cheer me on. Swim – T-5 minutes to GO TIME! It was now my turn to walk through the arch and find my place at the start line! I positioned myself away from the madness and planned to work my way to the buoys as others dropped back. This wasn’t the case as we had a sizeable pack for most of the swim. It felt more like a Royal Rumble than a swim for the first 7/10 of a mile, as it involved a lot of swimming over and around to get where I wanted to be! I finished the swim in 38:34. Thanks to the wetsuit strippers I was through transition and on my bike in no time! Run –I was excited to get out of T2 and run by friends and family again! After squeezing in a couple high fives I looked at my Garmin to see I was running too fast, and quickly slowed down my pace. The heat really started to take its toll on the 2nd loop. Squeezing wet sponges and holding snow in my hands felt good but didn’t cool me down enough. With about 3 miles to go I started to feel some tightening in my hamstring and dialed my pace to a walk until it loosened up. The tightness returned in the last half mile, and I remember saying, “WHY NOW!? I’M ALMOST DONE!” I dug deep down and made the turn towards the finish line. The cheering from the crowd was great! I even found my Dad to give him a high five as I was nearing the arch. I crossed in 5 hrs. 54 min. and set the bar for my next 70.3! It was great to be greeted at the finish line by Chrissie Wellington with my finisher’s medal and a handshake! Overall, this was a great race and a great experience! There is a lot I’ve learned which I can apply to my next 70.3 Ironman. I can’t say enough about the support from my family, Ali and her family, friends and teammates both spectating and on the course. The volunteers were also wonderful and showed encouragement and support from check in through the finish line! My QT2 Mission Plan was very well structured and Coach Tim Snow was always prompt in answering questions I had or adapting workouts when the need arose.